All across the United States this week, we will celebrate Thanksgiving. As Christians, we render special thanks to God for the many blessings we have received this year. 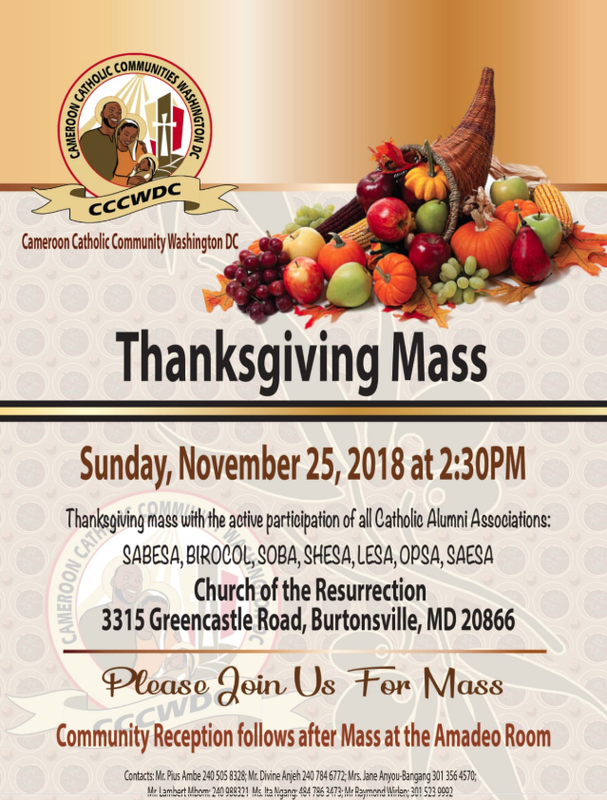 We have been blessed with such wonderful families within the Cameroon Catholic Community, Washington, D.C. Metro Area who have supported us in many ways through the years. We who are receiving the unshakable kingdom should have gratitude, with which we should offer worship pleasing to God in reverence and awe (Hebrews 12:28). Who can ever count all their blessings? Start with your life, your family, your friends, your health, your talents, just being here in the US at a time when there is so much carnage back home. Who claims that they have nothing to be grateful for? But, above all we have the gift of faith and God’s unconditional love. As good children, we must turn to Him and His Church and say: Thank You Lord for all that You have done for me. The support we give to our Church at community and parish levels, is an outward expression of our Catholic faith. Our Harvest Thanksgiving is the one unique opportunity in the year to show the joy of our hearts to God, to show our appreciation and support to Resurrection Catholic Church, our host parish, for her love and generosity toward us. The Resurrection Catholic Church is an invaluable asset to all of us and we should be able to thank this parish in all sincerity. This year, we have added the water project at CATUC to our objective. At a time when so many of our brethren are stuck in very desperate situations, we have a moral duty to help in one way or the other. Having already raised half of the funds needed to provide a borehole to CATUC, we are appealing to all Christians of goodwill within the DMV to help us to complete our balance and provide water to CATUC students. Our target for this year’s Thanksgiving is $10,000.00 for our host parish of the Resurrection and 5,000.00 to complete our balance for the water project back home. We are therefore asking all members of our Cameroon Catholic Community to contribute towards our efforts. All donations are tax deductible and a final list of all contributors will be published. We now accept electronic payments. Please click on the link below to make donate using credit/debit cards. You can also make cash app or Zelle donations through any member of the pastoral council. Once your transaction is completed, please post your receipt of the completed transaction on the cccwdc whatsapp forum for record keeping. 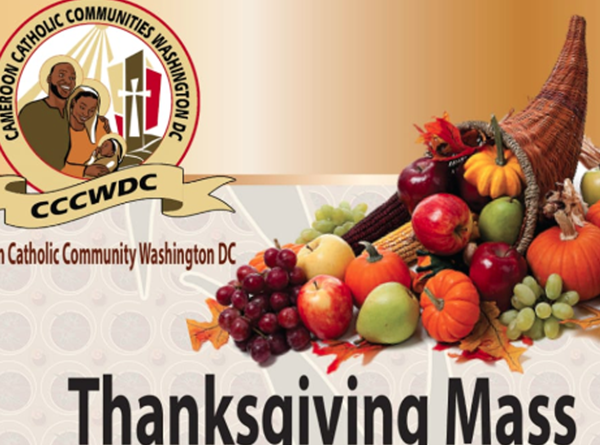 If you are unable to make electronic donations, please bring your checks/cash to church in sealed envelopes. The name of the donor must be on the envelope. Special collections from alumni associations will take place during Mass in the following order: SABESA, BIROCOL, SOBA, SHESA, LESA, OPSA, SAESA, all other Ex-students from various non-Catholic schools to be led by Fr. Mathias. Being a family celebration, we exhort you all to invite all our family members, friends, and well-wishers to come and support us to tell God: We are thankful. Let us remember always: To him who has been given more, more shall be expected. Let us offer God gifts that would be pleasing to Him and He will surely give us more in return.